Same to the Customs Cashier to pay 50l. to William Culliford, for last Christmas quarter's salary as Register of Seizures. Ibid. Same to same to pay 188l. to the Lord Privy Seal for half a year to Sept. 29 last on his fee of 20s. a day. Ibid. Same to [the Auditor of the Receipt] for tallies on the Tenths for 125l. for a quarter on Mris. Hamilton's pension of 500l. per an. Ibid. Same to Mr. Seymour [Treasurer of the Navy] out of the 5,000l. which you received of the Customs Cashier the 1st inst., to pay 3,000l. to Major Brett and his partners, Victuallers of the Navy, upon account of the victualling ; and the remaining 2,000l. to satisfy foreign bills of exchange drawn on the Commissioners of the Navy and some other necessary uses lately represented by the said Commissioners. Ibid, p. 384. Reference to the Customs Commissioners [from Treasurer Danby] of the petition of Robert Master (Masters) showing that Hen. Hampson, merchant at Amsterdam, did in June, 1676, receive 140 pieces of silk allajaces consigned to him by Sam. Sambrooke of London, merchant, but the goods being improper for that market Hampson consigned them to petitioner at London and they were accordingly shipped thither in May, 1678, on the Young Trump. Hampson swears they are the same goods which were received from London, but they are seized and entry refused because the Commissioners cannot find the time of shipping them to Holland and petititioner can get no account from Sambrooke, being insolvent. Petitioner therefore prays that they may be delivered by bill of store or upon payment of custom. Out Letters (Customs) IV. p. 184. 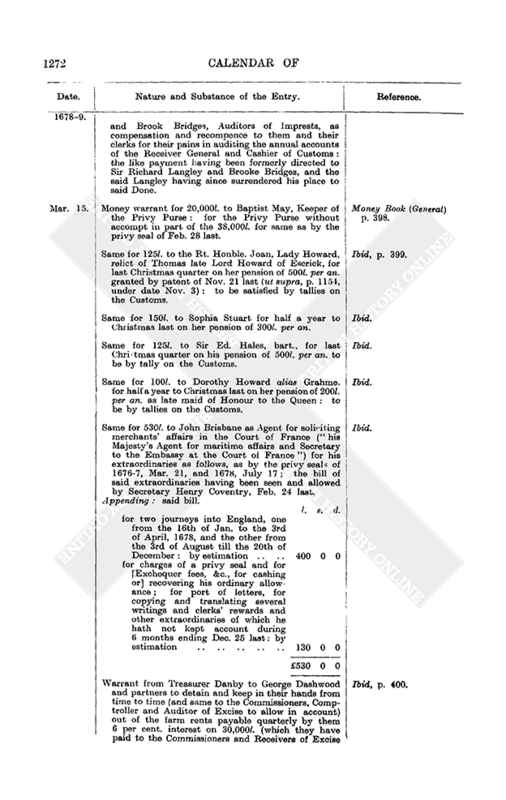 Same to same [from same] of the petition of William Coleman who by Sir John Shaw was appointed warehousekeeper, London port, loco Guy Molesworth, Esq., and prays the like salary of 50l. and 50l. per an. as allowed to Molesworth [? the latter 50l.] for Plantation business. Hereon Treasurer Danby desires the Customs Commissioners to advise what is fit to be done thereupon and whether such officer should not be appointed by the Customs Commissioners by warrant from the Lord Treasurer. Ibid, p. 186. Mr. Robert. Ryves desires on behalf of Mr. Curzon, Mr. Charles Ryves and himself that the docquets may not pass in order to the renewing of the Commission of Wine Licences till they are heard upon their petition to the Lord Treasurer [concerning same]. Caveat Book, p. 38. Charles Bertie to the Navy Commissioners to assign for payment Sir Thomas Clutterbuck's bill for 6,298l. 15s. 8d. out of the arrear of the weekly money of the Customs [due] before Christmas last as it [such arrear] shall come to the hands of the Treasurer of the Navy : this assignment is to be made presently [so as] to give Sir Thomas a [negociable or present or immediate] credit on his said bill to enable him to answer the King's service under his care. Out Letters (General) p. 384. Same to [the Auditor of the Receipt] for tallies for 50l. on the Excise and 150l. on the Tenths, making 200l. in all, for last Christmas quarter on Sir Samuel Morland's pensions of 200l. per an. on the Excise and of 400l. and 200l. per an. on the Tenths. (Same to the Receivers of Excise to pay said 50l. tally drawn on the Excise.) Ibid, p. 385. Same to the Customs Commissioners forwarding as follows from Prince Rupert that you may direct a prosecution of the seizure as follows. Appending : Char. Potts [to Prince Rupert] dated from Windsor Mar. 3. I received a warrant by Haddon this morning from Treasurer Danby to search and seize prohibited goods, which I have done and find that the loading of the 2 waggons I suspected is 8 hogsheads of claret, "of that we call Sellery." I have secured it at present in the castle by reasons the vessels were "lequie," but by the warrant it is to be sent to the King's warehouse ; which I shall observe as soon as I receive your commands. It was stolen ashore between Portsmouth and Southampton and 4 waggons came to this town about a week since with 4 hogsheads apiece and were sent by boat on Wednesday last to London to the Palsgrave Head Tavern [close] by Temple Bar, being of the same parcel. I have the names of the waggoner, vintner and the person to whom they pretend they belong, the rest being yet seizable, although in a vintner's seller. Pray conceal the place where the rest are least they steal them away. Out Letters (Customs) IV. pp. 184-5. Warrant from Treasurer Danby to same to employ Tho. King as a tidesman in fee, London port, loco Jno. Thorne, lately dismissed. Ibid, p. 185. Royal warrant to the Attorney or Solicitor General for a great seal for a grant to Sir John Lowther of Whitehaven, co. Cumberland, and his heirs and assigns for ever of all that ground or soil containing by estimation 150 acres or thereabouts lying between the high and low water marks of the sea near Whitehaven with the rocks thereupon being ; which said ground or soil extends from east to west 200 yards or thereabouts and from north to south 2 miles or thereabouts, the bounder thereof southward being Bransty Beck adjoining to lands of the said Sir John Lowther and the bounder north being Moresby Beck alias the Pow alias Morosby Pow, adjoining to a parcel of land there called Lowca ; which said ground or soil (as we are advised as well by you our Attorney as by our Surveyor General) is the right of our Crown and appears to us by a report made by the Surveyor General of Crown Lands to be a shelving shore, nothing but rocks and sand, of little or no value as it can be computed at present : all to hold to him his heirs and assigns for ever from the Crown as of the manor of East Greenwich, Kent, by fealty and the rent of 20s. per an. payable at Michaelmas only and not by Knight's service or any other tenure in capite. 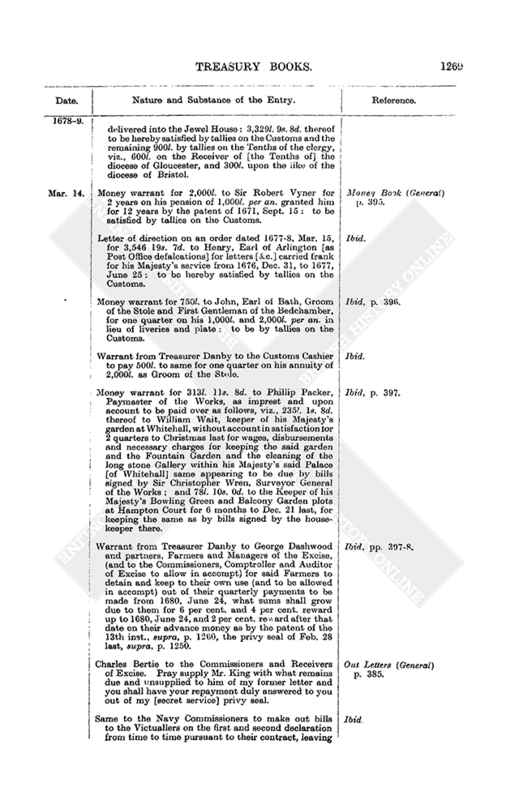 (Treasurer Danby's subscriptions dated Mar. 18 and Mar. 22 of docquets hereof. Both docquets apparently refer to one and the same grant, the one docquet being probably for the Privy Seal, the other for the Great Seal.) 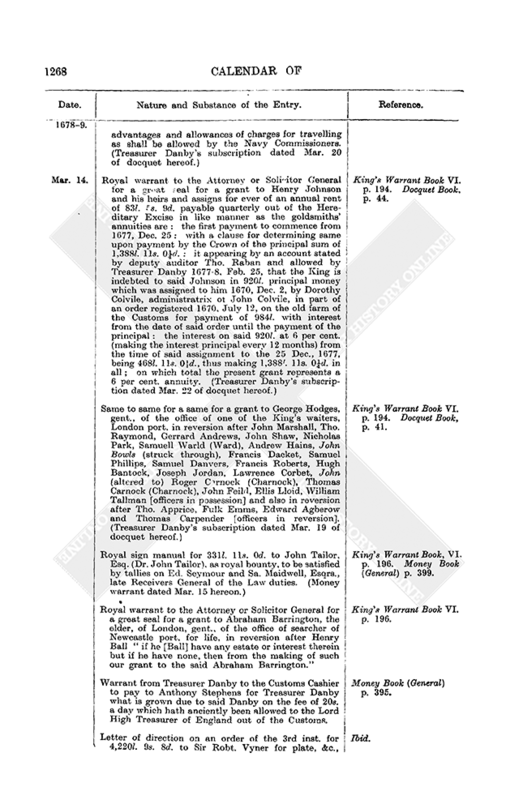 King's Warrant Book VI. pp. 190-1 Docquet Book, pp. 36, 43. Royal warrant to the Attorney or Solicitor General for a great seal to constitute and appoint Robert Spencer, Henry Fanshaw, and Charles Fanshaw, Esqrs., Sir Paul Neale, Kt., Peter Pridcaux, John Trelawney, William Coward (struck through). Francis Stephens, Edmo. 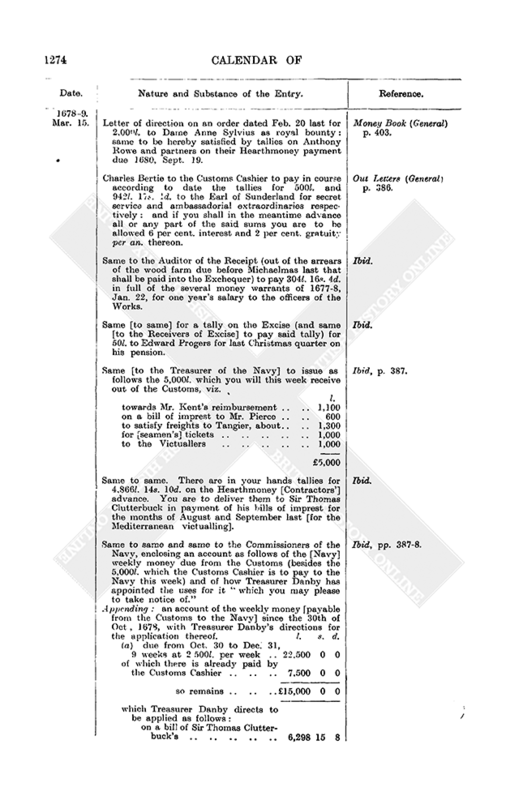 Doyley, Robert Maddocks, and also Charles Bertie and Thomas Lloyd to be Commissioners for Appeals and Regulating the duty of Excise : with the salary of 200l. per an. 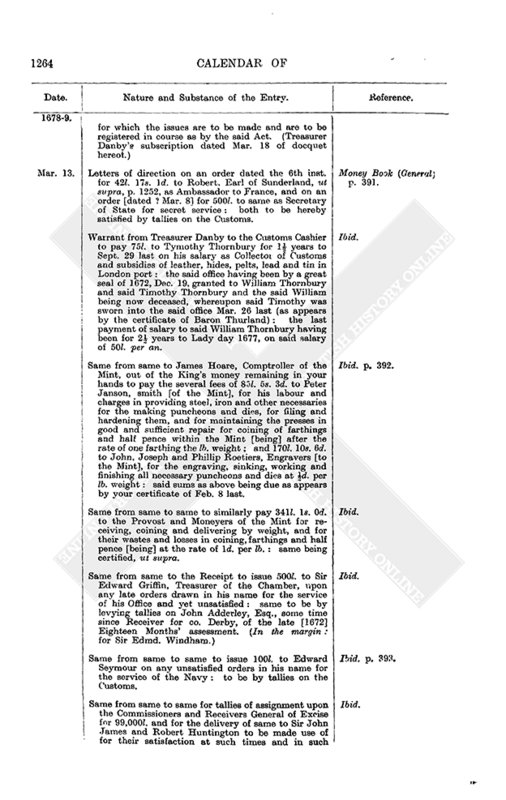 each : the first payment of salary to the first 9 of said Commissioners to be at — next, and to the said Bertie at the first quarter day after the death or other avoydance of any of the first named 9 Commissioners ; and likewise to the said Thomas Lloyd at the first quarter day after the death of any two of said 9 Commissioners or said Bertie. (See supra, p. 1204, under date Jan. 17. The effect of this warrant was to add Henry Fanshaw as a Commissioner in possession loco William Coward, and to add behind said Bertie said Lloyd as also a Commissioner in reversion.) (Treasurer Danby's subscription dated Mar. 19 of docquet hereof.) 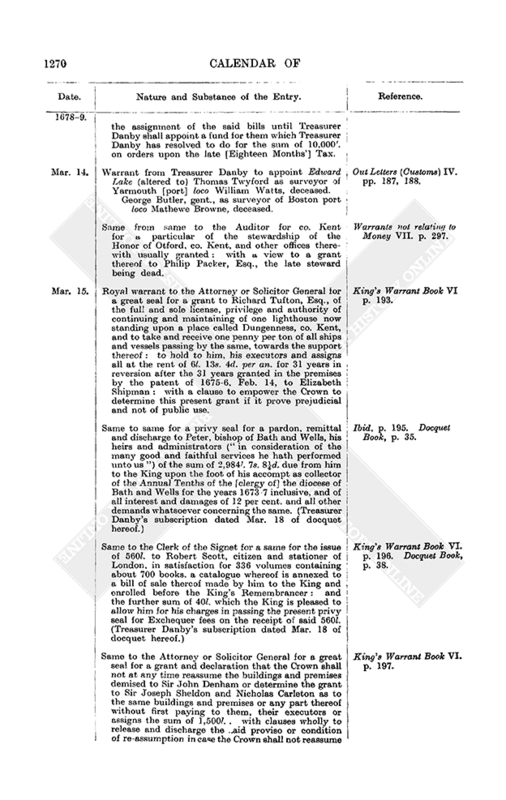 King's Warrant Book VI. p. 191. Docquet Book, p. 40. Same to the Clerk of the Signet for a privy seal for the issue of 58,400l. to the Treasurer of the Navy (out of the 584,978l. 2s. 2½d. granted by the Act of 29 Car. II. for building 30 ships of war) being for the building of the 4 remaining ships (the issues for building 26 out of said 30 ships having been already authorised by several privy seals) : the said 4 ships to be 2 second-rate and 2 third-rate, with masts and yards : and also for the issue of any other sum not exceeding 14,920l. as imprest for the providing and fitting the rigging, ground tackle and boats of the said 4 ships, and of any other sum not exceeding 6,092l. as imprest for boatswain's and carpenter's sea stores for same : making 79,412l. in all : "which the said particulars for the said four ships are computed to amount to by the estimates formerly presented to us in Council by the" Admiralty Lords. The orders that are to be drawn by virtue hereof are to contain in them expressly the several and respective uses aforesaid, for which the issues are to be made and are to be registered in course as by the said Act. (Treasurer Danby's subscription dated Mar. 18 of docquet hereof.) King's Warrant Book VI. p. 192. Docquet Book, p. 37.
Letters of direction on an order dated the 6th inst. for 42l. 17s. 1d. to Robert, Earl of Sunderland, ut supra, p. 1252, as Ambassador to France, and on an order [dated? Mar. 8] for 500l. to same as Secretary of State for secret service : both to be hereby satisfied by tallies on the Customs. Money Book (General) p. 391. Warrant from Treasurer Danby to the Customs Cashier to pay 75l. to Tymothy Thornbury for 1½ years to Sept. 29 last on his salary as Collector of Customs and subsidies of leather, hides, pelts, lead and tin in London port : the said office having been by a great seal of 1672, Dec. 19, granted to William Thornbury and said Timothy Thornbury and the said William being now deceased, whereupon said Timothy was sworn into the said office Mar. 26 last (as appears by the certificate of Baron Thurland) : the last payment of salary to said William Thornbury having been for 2½ years to Lady day 1677, on said salary of 50l. per an. Ibid. Same from same to James Hoare, Comptroller of the Mint, out of the King's money remaining in your hands to pay the several fees of 85l. 5s. 3d. to Peter Janson, smith [of the Mint], for his labour and charges in providing steel, iron and other necessaries for the making puncheons and dies, for filing and hardening them, and for maintaining the presses in good and sufficient repair for coining of farthings and half pence within the Mint [being] after the rate of one farthing the lb. weight ; and 170l. 10s. 6d. to John, Joseph and Phillip Roetiers, Engravers [to the Mint], for the engraving, sinking, working and finishing all necessary puncheons and dies at ½d. per lb. weight : said sums as above being due as appears by your certificate of Feb. 8 last. Ibid. p. 392. Same from same to same to similarly pay 341l. 1s. 0d. to the Provost and Moneyers of the Mint for receiving, coining and delivering by weight, and for their wastes and losses in coining, farthings and half pence [being] at the rate of 1d. per lb. : same being certified, ut supra. Ibid. Same from same to the Receipt to issue 500l. to Sir Edward Griffin, Treasurer of the Chamber, upon any late orders drawn in his name for the service of his Office and yet unsatisfied : same to be by levying tallies on John Adderley, Esq., some time since Receiver for co. Derby, of the late  Eighteen Months' assessment. (In the margin : for Sir Edmd. Windham.) Ibid. Same from same to same to issue 100l. to Edward Seymour on any unsatisfied orders in his name for the service of the Navy : to be by tallies on the Customs. Ibid. p. 393. Same from same to same for tallies of assignment upon the Commissioners and Receivers General of Excise for 99,000l. and for the delivery of same to Sir John James and Robert Huntington to be made use of for their satisfaction at such times and in such manner as by the great seal of the 10th inst. (ut supra, p. 1227-8) for securing to them their credit of 100,000l. 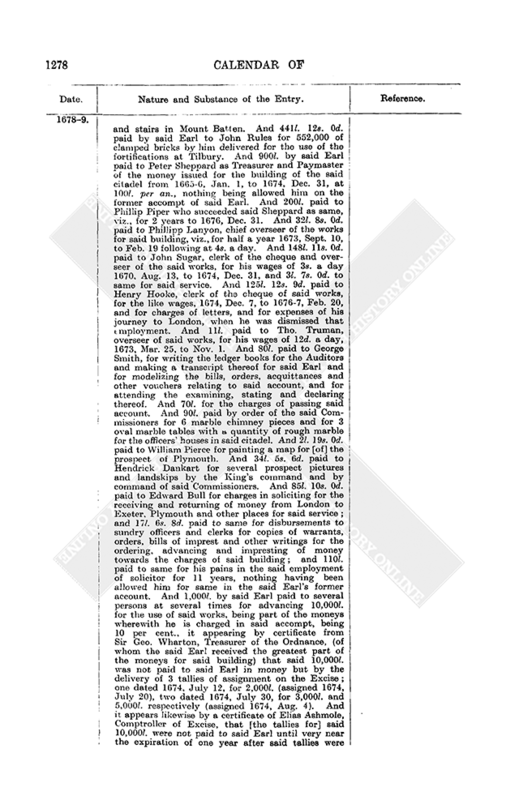 on the Excise : the said James and Huntington having given credit to the King for 99,000l., viz., 21,800l. to Henry Guy, Esq., and 17,000l. to Brook Bridge, Esq., to be by them assigned for the service of the Forces, and 60,200l. to Anthony Segar, gent., who is to assign the same as he shall be directed for his Majesty's service. Ibid. Money warrant for 1,300l. to Sir Leoline Jenkins for a quarter's ordinary Mar. 9 inst. to June 6 next, as one of the Ambassadors Extraordinary and Plenipotentiaries for the Treaty of Peace at Nimuegen : to be by tallies on the Customs. Money Book (General) p. 393. Same for 182l. to Roger Meredith for a quarter's ordinary of 40s. a day Nov. 23 last to Feb. 21 last, as Secretary to the Extraordinary Embassy to the States General of the United Provinces : to be by tallies on the Customs. Ibid. Same for 365l. 14s. 3d. to Sir Richard Bullstrode for several extraordinary charges by him laid out 1677, Dec. 15, to 1678, June 24, as his Majesty's Resident with the Governor of the Spanish Netherlands : to be by tallies on the Customs. Appending : (a) bill of said extraordinaries. Ibid, pp. 393-4. (b) attestation by Anth. Peeters, Charles Shuermans, witnesses, and A. De Castilion, notary public of Bulstrode's oath to the truth of the above account 12 Aug., 1678. (c) note of Henry Coventry's allowance, dated 1678-9, Feb. 19, of said bill. Warrant from Treasurer Danby to James Hoar, Comptroller of the Mint, to pay 200l. to William Tayleur (Taileur), gent., as recompence for his charges and pains as clerk to the Commissioners for inspecting the affairs of the Mint ; it being certified by report of Feb. 5 last from Sir William Smith, bart., one of the said Commissioners, that said Tayleur has been employed in the said service ever since 1677, Sept. 23, the date of said Commission, has been diligent and faithful therein and has expended 62l. 3s. 6d. in matters relating thereto. Money Book (General) p. 396. 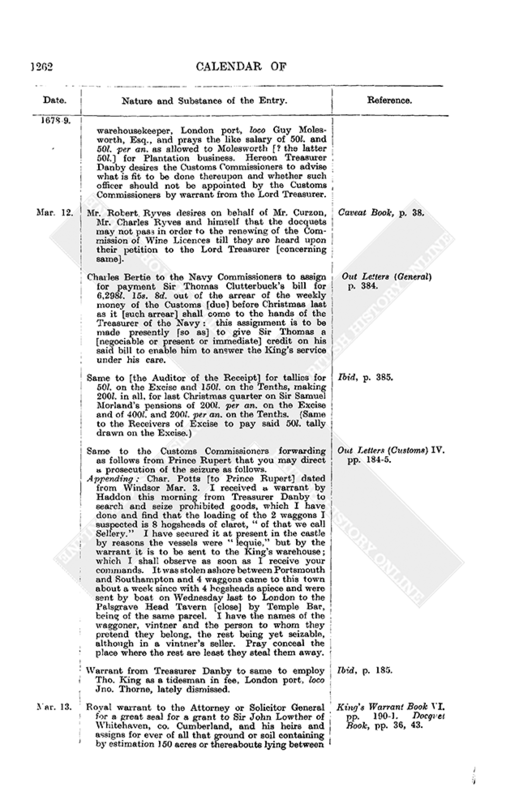 Charles Bertie to the Auditor of the Receipt to issue to Sir Thomas Allin for 2½ years on his fee of 40l. per an. as Governor of Sandgate Castle the 100l. which the Customs Cashier is to bring into the Exchequer. Out Letters (General) p. 385. Same to the Customs Commissioners. In your report on the petition of the inhabitants of Lowestoft you advise that several gruff goods specified may be imported [at Lowestoft] and that butter, cheese and fish may be exported or imported there. The petitioners now pray that corn and coal being the growth of that country may [also] be laden and unladen [there]. Treasurer Danby desires your report hereon whether it be fit to gratify them therein. Out Letters (Customs) IV. p. 186. Warrant from Treasurer Danby to same to employ Robert Holden as collector of Customs at Albemarle county in Carolina loco Seth Sentleill (who you are informed was taken by the Turks in his voyage thither) until he [St. Lisle] shall be redeemed. Thomas Tyrrill as a watchman, London port, on the first vacancy. Rowland Evans as a tidesman, ibid. loco Rich. Bye, lately dismissed. John Warner as gauger, London port, loco John Wale, deceased. Ibid, pp. 186, 187, 188, 189. Reference from same to same of the petition of Tho. Martin, Edward Solby, Richard Bye and John Thorne [tidesmen, London port], setting forth that they were dismissed on an information of Mr. Jones, one of the tidesurveyors of London port, and praying that proof may be made on oath of the allegations against them, they having an affidavit of the falseness thereof. Ibid, p. 187. Warrant from same to the Kings' Remembrancer to supersede till further order all process ad computandam against John Lloyd, late Receiver of the Royal and Additional Aids and other taxes for the counties of South Wales or Monmouth. Warrants not relating to Money VII. p. 294. Same from same to Henry Slingsby, Esq., Master and Worker of the Mint. It has been represented to the King in Council that James Burkin and Henry Waad of London, merchants, have upon their hands 16,500lb. weight of copper blanks fit for farthings and half pence which were imported pursuant to a contract between James Hoare, Comptroller of the Mint, and Abraham Croonestrom of Stockholm. merchant. The King has thought fit to let the same be coined notwithstanding a preceding order of Council of 1676, May 26, prohibiting copper farthings to be coined. By order in Council of the 8th inst. the King has further directed that the said 16,500lb. of blanks shall be coined and delivered to such person as I shall appoint to distribute the same. You are hereby to coin same into half pence and farthings and to deliver same to William Tayleur to be by him vended and disposed of, he paying the merchant for the same after the rate of 14½d. per lb. weight according to agreement and defraying the charges of coining, stamping and all other charges thereto belonging. Ibid, p. 295. Warrant from Treasurer Danby to James Hoare, Comptroller of the Mint. By a report of July 8 last from the Commissioners for inspecting the affairs of the Mint I am certified that there is due to James Burkin and Company, assignees of Abraham Croonstrom of Stockholm, 312l. 13s 0d. upon the balance of an accompt between you and them for several quantities of copper blanks by you bought for the King's use, and that the said Burkin and Company have made a proposal on behalf of said Croonstrom that upon the payment of said 312l. 13s. 0d. and the taking off their 16,500lb. weight of copper blanks as above they will discharge you of the 1,600l. claimed as due to the said Croonstrom upon an agreement sometime since made between you and him for copper blanks at 17d. per lb. weight, which rate you were induced to agree to upon pretence of an imposition laid upon copper in Sweden. This proposal the Commissioners for inspecting the affairs of the Mint have advised me to accept. You are accordingly hereby to pay said Burkin and Company said 312l 13s. 0d. and to take from them such discharges as you think sufficient for your indemnification. Warrants not relating to Money VII. p. 295. Same from same to the Auditors of Imprests. In pursuance of an order in Council of June 8 last I did by warrant of June 17 last direct the abovesaid James Hoare to deliver to the Commissioners for inspecting the affairs of the Mint, the farthings and half pence in his hands to the value of 7,281l. 8s. 8¾d. This being accordingly done I did by my warrant of July 11 last (in pursuance of said Commissioners' agreement with Thomas Doyley) direct them to deliver same to said Doyley on payment of 6,965l. by said Doyley to said Comptroller, allowing him [Doyley] 35l. for a month's rebate of interest on 7,000l. and 281l. 8s. 8¾d. for his pains, making 316l. 8s. 8¾d. in all : all which was accordingly performed. You are hereby to cause said Hoare to speedily account and therein to make [him] allowance of said 316l. 8s. 8¾d. Ibid, p. 296. Royal warrant to the Attorney or Solicitor General for a great seal to make void the letters patent, supra, p. 1209, which appointed John Godwyn (Godwin) to be Surveyor General of the Victuals during pleasure and with the fee of 250l. per an., and to regrant said office to said Goodwin during pleasure and with the fee of 300l. per an. to commence from Christmas last, together with the allowance of 8d. a day for a clerk and such other emoluments, advantages and allowances of charges for travelling as shall be allowed by the Navy Commissioners. (Treasurer Danby's subscription dated Mar. 20 of docquet hereof.) King's Warrant Book VI. p. 192. Docquet Book, p. 42. Royal warrant to the Attorney or Solicitor General for a great seal for a grant to Henry Johnson and his heirs and assigns for ever of an annual rent of 83l. 5s. 9d. 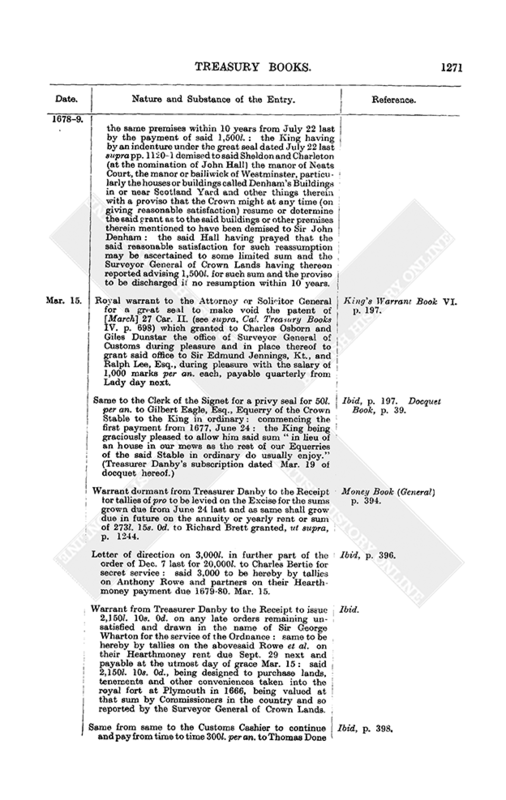 payable quarterly out of the Hereditary Excise in like manner as the goldsmiths' annuities are : the first payment to commence from 1677, Dec. 25 : with a clause for determining same upon payment by the Crown of the principal sum of 1,388l. 11s. 0¼d. : it appearing by an account stated by deputy auditor Tho. Raban and allowed by Treasurer Danby 1677-8, Feb. 25, that the King is indebted to said Johnson in 920l. principal money which was assigned to him 1670, Dec. 2, by Dorothy Colvile, administratrix of John Colvile, in part of an order registered 1670, July 12, on the old farm of the Customs for payment of 984l. with interest from the date of said order until the payment of the principal : the interest on said 920l. at 6 per cent. (making the interest principal every 12 months) from the time of said assignment to the 25 Dec., 1677, being 468l. 11s. 0¼d., thus making 1,388l. 11s. 0¼d. in all ; on which total the present grant represents a 6 per cent. annuity. (Treasurer Danby's subscription dated Mar. 22 of docquet hereof.) 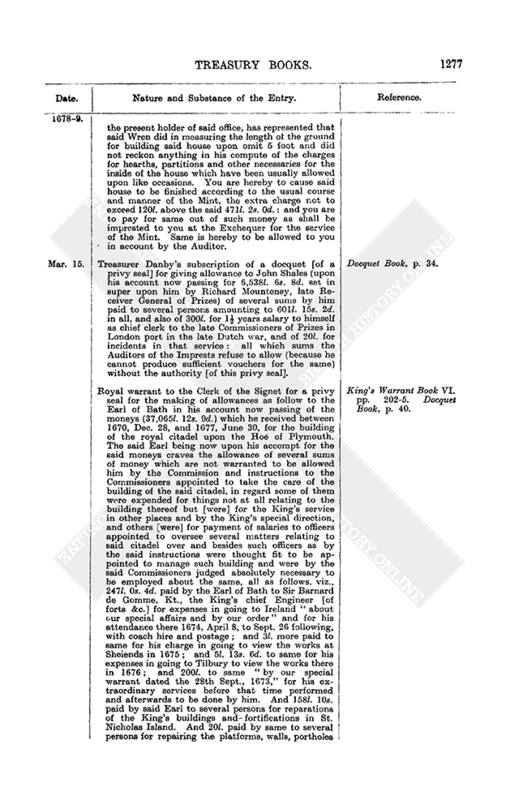 King's Warrant Book VI. p. 194. Docquet Book, p. 44. Same to same for a same for a grant to George Hodges, gent., of the office of one of the King's waiters, London port, in reversion after John Marshall, Tho. Raymond, Gerrard Andrews, John Shaw, Nicholas Park, Samuell Warld (Ward), Andrew Hains, John Bowls (struck through), Francis Dacket, Samuel Phillips, Samuel Danvers, Francis Roberts, Hugh Bantock, Joseph Jordan, Lawrence Corbet, John (altered to) Roger Carnock (Charnock), Thomas Carnock (Charnock), John Feild, Ellis Lloid, William Tallman [officers in possession] and also in reversion after Tho. Apprice, Fulk Emms, Edward Agberow and Thomas Carpender [officers in reversion]. 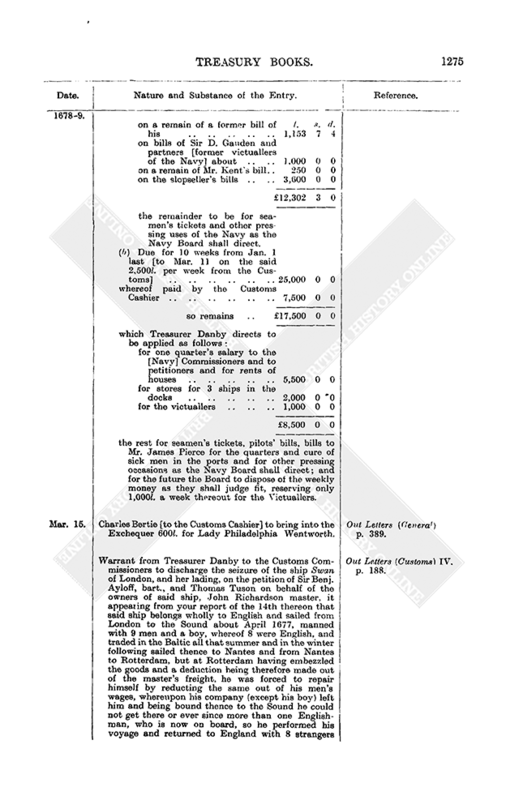 (Treasurer Danby's subscription dated Mar. 19 of docquet hereof.) 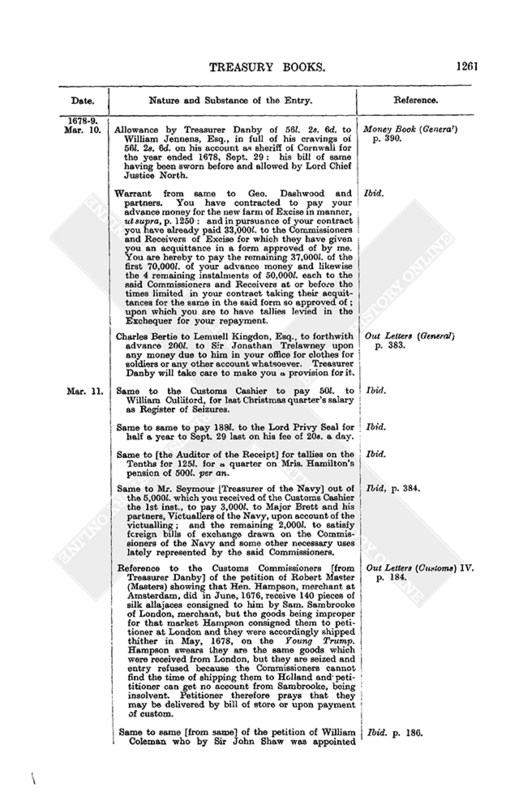 King's Warrant Book VI. p. 194. Docquet Book, p. 41. Royal sign manual for 331l. 11s. 0d. to John Tailor, Esq. (Dr. John Tailor), as royal bounty, to be satisfied by tallies on Ed. Seymour and Sa. Maidwell, Esqrs., late Receivers General of the Law duties. (Money warrant dated Mar. 15 hereon.) King's Warrant Book, VI. p. 196. Money Book (General) p. 399. Royal warrant to the Attorney or Solicitor General for a great seal for a grant to Abraham Barrington, the elder, of London, gent., of the office of searcher of Newcastle port, for life, in reversion after Henry Ball "if he [Ball] have any estate or interest therein but if he have none, then from the making of such our grant to the said Abraham Barrington." King's Warrant Book VI. p. 196. Warrant from Treasurer Danby to the Customs Cashier to pay to Anthony Stephens for Treasurer Danby what is grown due to said Danby on the fee of 20s. a day which hath anciently been allowed to the Lord High Treasurer of England out of the Customs. Money Book (General) p. 395. Letter of direction on an order of the 3rd inst. for 4,220l. 9s. 8d. to Sir Robt. Vyner for plate, &c., delivered into the Jewel House : 3,329l. 9s. 8d. thereof to be hereby satisfied by tallies on the Customs and the remaining 900l. by tallies on the Tenths of the clergy, viz., 600l. on the Receiver of [the Tenths of] the diocese of Gloucester, and 300l. upon the like of the diocese of Bristol. Ibid. Money warrant for 2,000l. to Sir Robert Vyner for 2 years on his pension of 1,000l. per an. granted him for 12 years by the patent of 1671, Sept. 15 : to be satisfied by tallies on the Customs. Money Book (General) p. 395. Letter of direction on an order dated 1677-8, Mar. 15, for 3,546 19s. 7d. to Henry, Earl of Arlington [as Post Office defalcations] for letters [&c.] carried frank for his Majesty's service from 1676, Dec. 31, to 1677, June 25 : to be hereby satisfied by tallies on the Customs. Ibid. 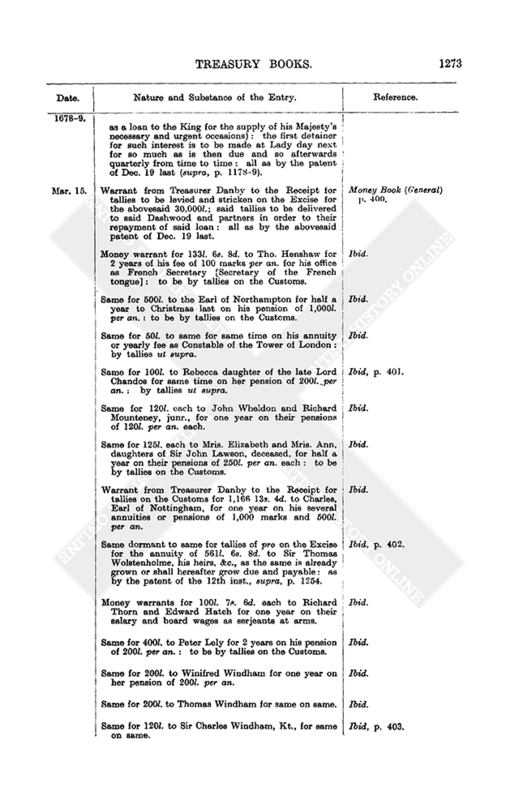 Money warrant for 750l. to John, Earl of Bath, Groom of the Stole and First Gentleman of the Bedchamber, for one quarter on his 1,000l. and 2,000l. per an. in lieu of liveries and plate : to be by tallies on the Customs. Ibid, p. 396. Warrant from Treasurer Danby to the Customs Cashier to pay 500l. to same for one quarter on his annuity of 2,000l. as Groom of the Stole. Ibid. Money warrant for 313l. 11s. 8d. to Phillip Packer, Paymaster of the Works, as imprest and upon account to be paid over as follows, viz., 235l. 1s. 8d. thereof to William Wait, keeper of his Majesty's garden at Whitehall, without account in satisfaction for 2 quarters to Christmas last for wages, disbursements and necessary charges for keeping the said garden and the Fountain Garden and the cleaning of the long stone Gallery within his Majesty's said Palace [of Whitehall] same appearing to be due by bills signed by Sir Christopher Wren, Surveyor General of the Works ; and 78l. 10s. 0d. to the Keeper of his Majesty's Bowling Green and Balcony Garden plots at Hampton Court for 6 months to Dec. 21 last, for keeping the same as by bills signed by the housekeeper there. Ibid, p. 397. Warrant from Treasurer Danby to George Dashwood and partners, Farmers and Managers of the Excise, (and to the Commissioners, Comptroller and Auditor of Excise to allow in accompt) for said Farmers to detain and keep to their own use (and to be allowed in accompt) out of their quarterly payments to be made from 1680, June 24, what sums shall grow due to them for 6 per cent. and 4 per cent. reward up to 1680, June 24, and 2 per cent. reward after that date on their advance money as by the patent of the 13th inst., supra, p. 1260, the privy seal of Feb. 28 last, supra, p. 1250. Ibid, pp. 397-8. Charles Bertie to the Commissioners and Receivers of Excise. Pray supply Mr. King with what remains due and unsupplied to him of my former letter and you shall have your repayment duly answered to you out of my [secret service] privy seal. Out Letters (General) p. 385. Same to the Navy Commissioners to make out bills to the Victuallers on the first and second declaration from time to time pursuant to their contract, leaving the assignment of the said bills until Treasurer Danby shall appoint a fund for them which Treasurer Danby has resolved to do for the sum of 10,000l. on orders upon the late [Eighteen Months'] Tax. Ibid. Warrant from Treasurer Danby to appoint Edward Lake (altered to) Thomas Twyford as surveyor of Yarmouth [port] loco William Watts, deceased. George Butler, gent., as surveyor of Boston port loco Mathewe Browne, deceased. Out Letters (Customs) IV. pp. 187, 188. Same from same to the Auditor for co. Kent for a particular of the stewardship of the Honor of Otford, co. Kent, and other offices therewith usually granted : with a, view to a grant thereof to Philip Packer, Esq., the late steward being dead. Warrants not relating to Money VII. p. 297. Royal warrant to the Attorney or Solicitor General for a great seal for a grant to Richard Tufton, Esq., of the full and sole license, privilege and authority of continuing and maintaining of one lighthouse now standing upon a place called Dungenness, co. Kent, and to take and receive one penny per ton of all ships and vessels passing by the same, towards the support thereof : to hold to him, his executors and assigns all at the rent of 6l. 13s. 4d. per an. for 31 years in reversion after the 31 years granted in the premises by the patent of 1675-6. Feb. 14, to Elizabeth Shipman : with a clause to empower the Crown to determine this present grant if it prove prejudicial and not of public use. 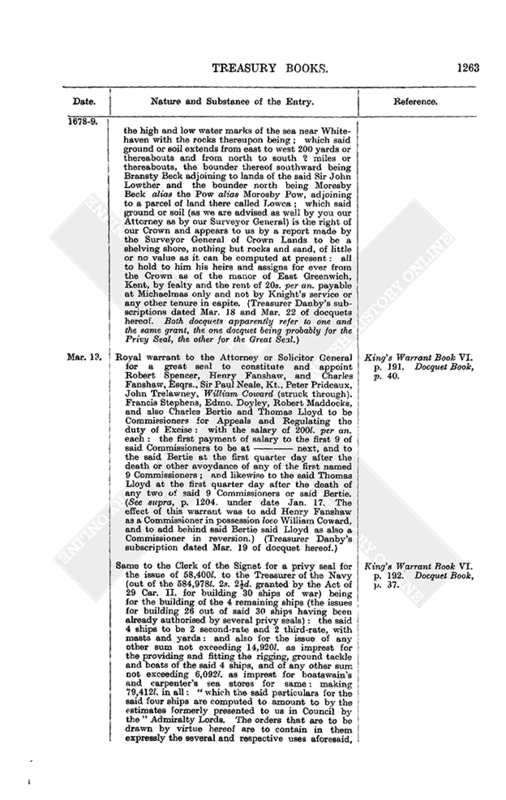 King's Warrant Book VI p. 193. Same to same for a privy seal for a pardon, remittal and discharge to Peter, bishop of Bath and Wells, his heirs and administrators ("in consideration of the many good and faithful services he hath performed unto us") of the sum of 2,984l. 7s. 8¼d. due from him to the King upon the foot of his accompt as collector of the Annual Tenths of the [clergy of] the diocese of Bath and Wells for the years 1673-7 inclusive, and of all interest and damages of 12 per cent. and all other demands whatsoever concerning the same. (Treasurer Danby's subscription dated Mar. 18 of docquet hereof.) Ibid, p. 195. Docquet Book, p. 35. Same to the Clerk of the Signet for a same for the issue of 560l. to Robert Scott, citizen and stationer of London, in satisfaction for 336 volumes containing about 700 books, a catalogue whereof is annexed to a bill of sale thereof made by him to the King and enrolled before the King's Remembrancer : and the further sum of 40l. which the King is pleased to allow him for his charges in passing the present privy seal for Exchequer fees on the receipt of said 560l. (Treasurer Danby's subscription dated Mar. 18 of docquet hereof.) King's Warrant Book VI. p. 196. Docquet Book, p. 38. Same to the Attorney or Solicitor General for a great seal for a grant and declaration that the Crown shall not at any time reassume the buildings and premises demised to Sir John Denham or determine the grant to Sir Joseph Sheldon and Nicholas Carleton as to the same buildings and premises or any part thereof without first paying to them, their executors or assigns the sum of 1,500l., with clauses wholly to release and discharge the aid proviso or condition of re-assumption in case the Crown shall not reassume the same premises within 10 years from July 22 last by the payment of said 1,500l. : the King having by an indenture under the great seal dated July 22 last supra pp. 1120-1 demised to said Sheldon and Charleton (at the nomination of John Hall) the manor of Neats Court, the manor or bailiwick of Westminster, particularly the houses or buildings called Denham's Buildings in or near Scotland Yard and other things therein with a proviso that the Crown might at any time (on giving reasonable satisfaction) resume or determine the said grant as to the said buildings or other premises therein mentioned to have been demised to Sir John Denham : the said Hall having prayed that the said reasonable satisfaction for such reassumption may be ascertained to some limited sum and the Surveyor General of Crown Lands having thereon reported advising 1,500l. for such sum and the proviso to be discharged if no resumption within 10 years. 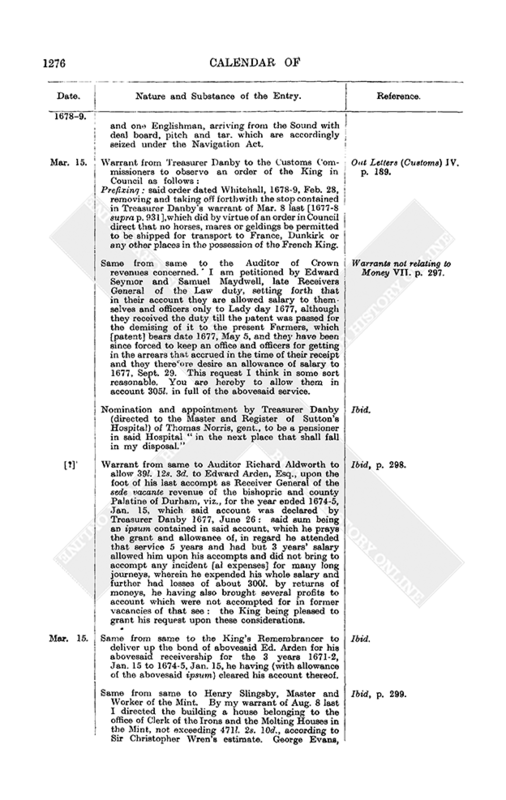 King's Warrant Book VI. p. 197. Royal warrant to the Attorney or Solicitor General for a great seal to make void the patent of [March] 27 Car. II. (see supra, Cal. Treasury Books IV. 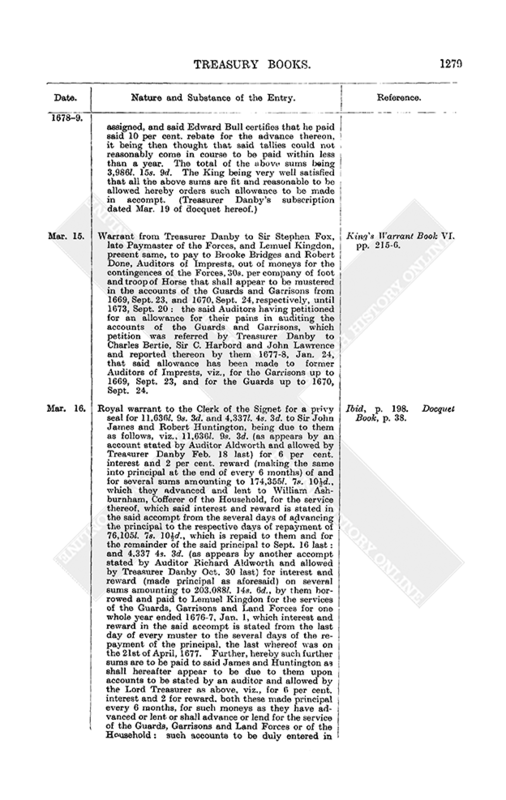 p. 698) which granted to Charles Osborn and Giles Dunstar the office of Surveyor General of Customs during pleasure and in place thereof to grant said office to Sir Edmund Jennings, Kt., and Ralph Lee, Esq., during pleasure with the salary of 1,000 marks per an. each, payable quarterly from Lady day next. 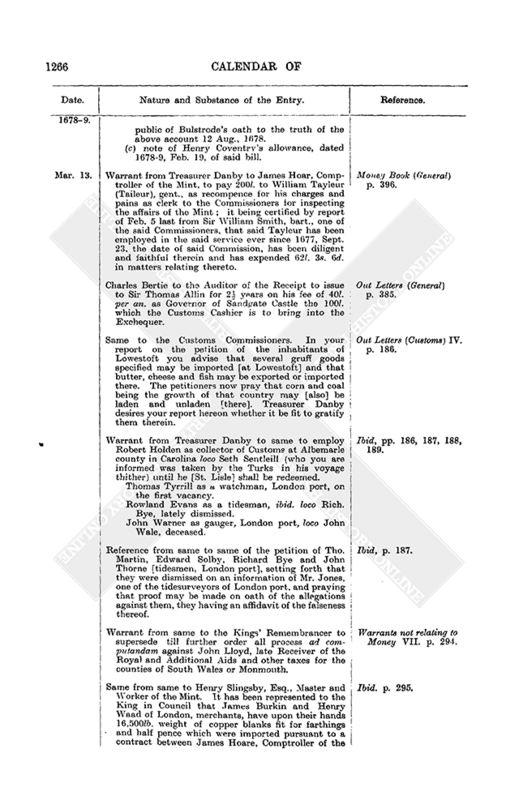 King's Warrant Book VI. p. 197. Same to the Clerk of the Signet for a privy seal for 50l. per an. to Gilbert Eagle, Esq., Equerry of the Crown Stable to the King in ordinary : commencing the first payment from 1677, June 24 : the King being graciously pleased to allow him said sum "in lieu of an house in our mews as the rest of our Equerries of the said Stable in ordinary do usually enjoy." (Treasurer Danby's subscription dated Mar. 19 of docquet hereof.) Ibid, p. 197. Docquet Book, p. 39. Warrant dormant from Treasurer Danby to the Receipt for tallies of pro to be levied on the Excise for the sums grown due from June 24 last and as same shall grow due in future on the annuity or yearly rent or sum of 273l. 15s. 0d. to Richard Brett granted, ut supra, p. 1244. Money Book (General) p. 394. Letter of direction on 3,000l. in further part of the order of Dec. 7 last for 20,000l. to Charles Bertie for secret service : said 3,000 to be hereby by tallies on Anthony Rowe and partners on their Hearthmoney payment due 1679-80. Mar. 15. Ibid, p. 396. Warrant from Treasurer Danby to the Receipt to issue 2,150l. 10s. 0d. on any late orders remaining unsatisfied and drawn in the name of Sir George Wharton for the service of the Ordnance : same to be hereby by tallies on the abovesaid Rowe et al. on their Hearthmoney rent due Sept. 29 next and payable at the utmost day of grace Mar. 15 : said 2,150l. 10s. 0d., being designed to purchase lands, tenements and other conveniences taken into the royal fort at Plymouth in 1666, being valued at that sum by Commissioners in the country and so reported by the Surveyor General of Crown Lands. Ibid. Same from same to the Customs Cashier to continue and pay from time to time 300l. per an. to Thomas Done and Brook Bridges, Auditors of Imprests, as compensation and recompence to them and their clerks for their pains in auditing the annual accounts of the Receiver General and Cashier of Customs : the like payment having been formerly directed to Sir Richard Langley and Brooke Bridges, and the said Langley having since surrendered his place to said Done. Ibid, p. 398. Money warrant for 20,000l. to Baptist May, Keeper of the Privy Purse : for the Privy Purse without accompt in part of the 38,000l. for same as by the privy seal of Feb. 28 last. Money Book (General) p. 398. Same for 125l. to the Rt. Honble. Joan, Lady Howard, relict of Thomas late Lord Howard of Escrick, for last Christmas quarter on her pension of 500l. per an. granted by patent of Nov. 21 last (ut supra, p. 1154, under date Nov. 3) : to be satisfied by tallies on the Customs. Ibid, p. 399. Same for 150l. to Sophia Stuart for half a year to Christmas last on her pension of 300l. per an. Ibid. Same for 125l. to Sir Ed. Hales, bart., for last Christmas quarter on his pension of 500l. per an. to be by tally on the Customs. Ibid. Same for 100l. to Dorothy Howard alias Grahme, for half a year to Christmas last on her pension of 200l. per an. as late maid of Honour to the Queen : to be by tallies on the Customs. Ibid. Same for 530l. to John Brisbane as Agent for soliciting merchants' affairs in the Court of France ("his Majesty's Agent for maritime affairs and Secretary to the Embassy at the Court of France") for his extraordinaries as follows, as by the privy seals of 1676-7, Mar. 21, and 1678, July 17 ; the bill of said extraordinaries having been seen and allowed by Secretary Henry Coventry, Feb. 24 last. Appending : said bill. Ibid. Warrant from Treasurer Danby to George Dashwood and partners to detain and keep in their hands from time to time (and same to the Commissioners, Comptroller and Auditor of Excise to allow in account) out of the farm rents payable quarterly by them 6 per cent. interest on 30,000l. 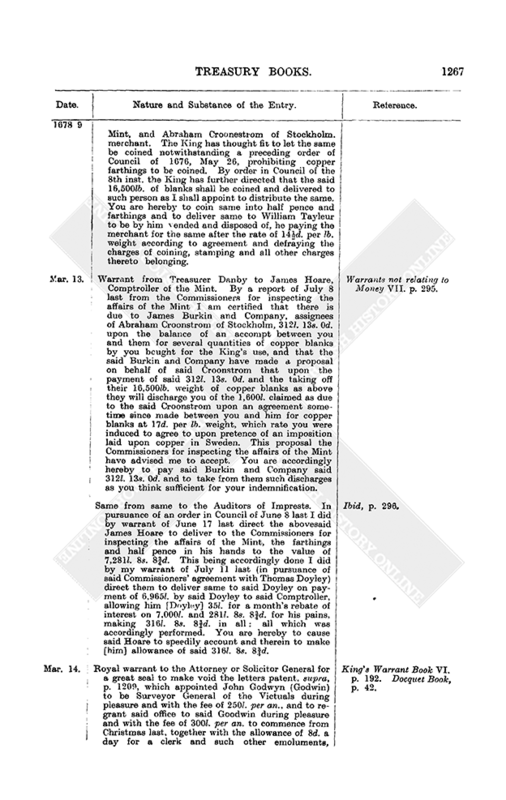 (which they have paid to the Commissioners and Receivers of Excise as a loan to the King for the supply of his Majesty's necessary and urgent occasions) : the first detainer for such interest is to be made at Lady day next for so much as is then due and so afterwards quarterly from time to time : all as by the patent of Dec. 19 last (supra, p. 1178-9). Ibid, p. 400. Warrant from Treasurer Danby to the Receipt for tallies to be levied and stricken on the Excise for the abovesaid 30,000l. ; said tallies to be delivered to said Dashwood and partners in order to their repayment of said loan : all as by the abovesaid patent of Dec. 19 last. Money Book (General) p. 400. Money warrant for 133l. 6s. 8d. to Tho. Henshaw for 2 years of his fee of 100 marks per an. for his office as French Secretary [Secretary of the French tongue] : to be by tallies on the Customs. Ibid. Same for 500l. to the Earl of Northampton for half a year to Christmas last on his pension of 1,000l. per an. : to be by tallies on the Customs. Ibid. Same for 50l. to same for same time on his annuity or yearly fee as Constable of the Tower of London : by tallies ut supra. Ibid. Same for 100l. to Rebecca daughter of the late Lord Chandos for same time on her pension of 200l. per an. : by tallies ut supra. Ibid, p. 401. Same for 120l. each to John Wheldon and Richard Mounteney, junr., for one year on their pensions of 120l. per an. each. Ibid. Same for 125l. each to Mris. Elizabeth and Mris. Ann, daughters of Sir John Lawson, deceased, for half a year on their pensions of 250l. per an. each : to be by tallies on the Customs. Ibid. Warrant from Treasurer Danby to the Receipt for tallies on the Customs for 1,166 13s. 4d. to Charles, Earl of Nottingham, for one year on his several annuities or pensions of 1,000 marks and 500l. per an. Ibid. Same dormant to same for tallies of pro on the Excise for the annuity of 561l. 6s. 8d. to Sir Thomas Wolstenholme, his heirs, &c., as the same is already grown or shall hereafter grow due and payable : as by the patent of the 12th inst., supra, p. 1254. Ibid, p. 402. Money warrants for 100l. 7s. 6d. each to Richard Thorn and Edward Hatch for one year on their salary and board wages as serjeants at arms. Ibid. Same for 400l. to Peter Lely for 2 years on his pension of 200l. per an. : to be by tallies on the Customs. Ibid. Same for 200l. to Winifred Windham for one year on her pension of 200l. per an. Ibid. Same for 200l. to Thomas Windham for same on same. Ibid. Same for 120l. to Sir Charles Windham, Kt., for same on same. Ibid, p. 403. Letter of direction on an order dated Feb. 20 last for 2,000l. to Dame Anne Sylvius aa royal bounty : same to be hereby satisfied by tallies on Anthony Rowe and partners on their Hearthmoney payment due 1680, Sept. 19. Money Book (General) p. 403. Charles Bertie to the Customs Cashier to pay in course according to date the tallies for 500l. and 942l. 17s. 1d. to the Earl of Sunderland for secret service and ambassadorial extraordinaries respectively : and if you shall in the meantime advance all or any part of the said sums you are to be allowed 6 per cent. interest and 2 per cent. gratuity per an. thereon. Out Letters (General) p. 386. Same to the Auditor of the Receipt (out of the arrears of the wood farm due before Michaelmas last that shall be paid into the Exchequer) to pay 304l. 16s. 4d. in full of the several money warrants of 1677-8, Jan. 22, for one year's salary to the officers of the Works. Ibid. Same [to same] for a tally on the Excise (and same [to the Receivers of Excise] to pay said tally) for 50l. to Edward Progers for last Christmas quarter on his pension. Ibid. Same [to the Treasurer of the Navy] to issue as follows the 5,000l. which you will this week receive out of the Customs, viz. Ibid, p. 387. Same to same. There are in your hands tallies for 4,866l. 14s. 10d. on the Hearthmoney [Contractors'] advance. You are to deliver them to Sir Thomas Clutterbuck in payment of his bills of imprest for the months of August and September last [for the Mediterranean victualling]. Ibid. Same to same and same to the Commissioners of the Navy, enclosing an account as follows of the [Navy] weekly money due from the Customs (besides the 5,000l. which the Customs Cashier is to pay to the Navy this week) and of how Treasurer Danby has appointed the uses for it "which you may please to take notice of." Appending : an account of the weekly money [payable from the Customs to the Navy] since the 30th of Oct, 1678, with Treasurer Danby's directions for the application thereof. Ibid, pp. 387-8.
the remainder to be for seamen's tickets and other pressing uses of the Navy as the Navy Board shall direct. the rest for seamen's tickets, pilots' bills, bills to Mr. James Pierce for the quarters and cure of sick men in the ports and for other pressing occasions as the Navy Board shall direct ; and for the future the Board to dispose of the weekly money as they shall judge fit, reserving only 1,000l. a week thereout for the Victuallers. Charles Bertie [to the Customs Cashier] to bring into the Exchequer 600l. for Lady Philadelphia Wentworth. Out Letters (General) p. 389. Warrant from Treasurer Danby to the Customs Commissioners to discharge the seizure of the ship Swan of London, and her lading, on the petition of Sir Benj. Ayloff, bart., and Thomas Tuson on behalf of the owners of said ship, John Richardson master, it appearing from your report of the 14th thereon that said ship belongs wholly to English and sailed from London to the Sound about April 1677, manned with 9 men and a boy, whereof 8 were English, and traded in the Baltic all that summer and in the winter following sailed thence to Nantes and from Nantes to Rotterdam, but at Rotterdam having embezzled the goods and a deduction being therefore made out of the master's freight, he was forced to repair himself by reducting the same out of his men's wages, whereupon his company (except his boy) left him and being bound thence to the Sound he could not get there or ever since more than one Englishman, who is now on board, so he performed his voyage and returned to England with 8 strangers and one Englishman, arriving from the Sound with deal board, pitch and tar, which are accordingly seized under the Navigation Act. Out Letters (Customs) IV. p. 188. Prefixing : said order dated Whitehall, 1678-9, Feb. 28, removing and taking off forthwith the stop contained in Treasurer Danby's warrant of Mar. 8 last [1677-8 supra p. 931], which did by virtue of an order in Council direct that no horses, mares or geldings be permitted to be shipped for transport to France, Dunkirk or any other places in the possession of the French King. Out Letters (Customs) IV. p. 189. Same from same to the Auditor of Crown revenues concerned. 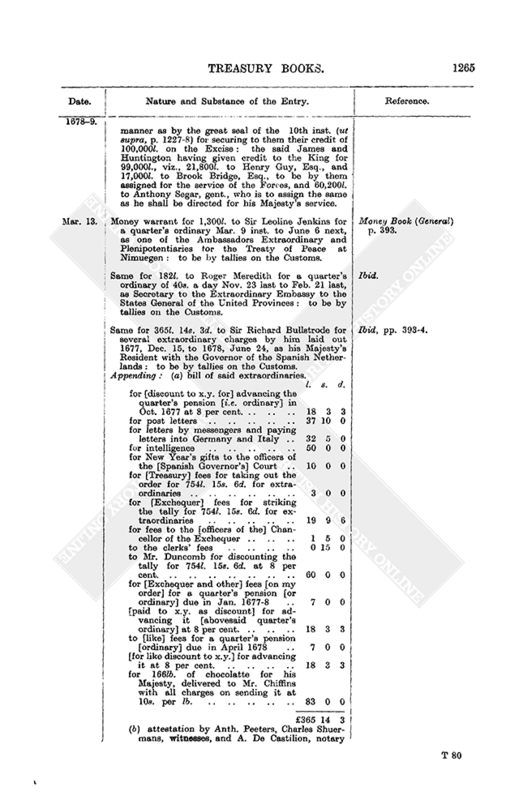 I am petitioned by Edward Seymor and Samuel Maydwell, late Receivers General of the Law duty, setting forth that in their account they are allowed salary to themselves and officers only to Lady day 1677, although they received the duty till the patent was passed for the demising of it to the present Farmers, which [patent] bears date 1677, May 5, and they have been since forced to keep an office and officers for getting in the arrears that accrued in the time of their receipt and they therefore desire an allowance of salary to 1677, Sept. 29. This request I think in some sort reasonable. You are hereby to allow them in account 305l. in full of the abovesaid service. Warrants not relating to Money VII. p. 297. Nomination and appointment by Treasurer Danby (directed to the Master and Register of Sutton's Hospital) of Thomas Norris, gent., to be a pensioner in said Hospital "in the next place that shall fall in my disposal." Ibid. [?] Warrant from same to Auditor Richard Aldworth to allow 39l. 12s. 3d. to Edward Arden, Esq., upon the foot of his last accompt as Receiver General of the sede vacante revenue of the bishopric and county Palatine of Durham, viz., for the year ended 1674-5, Jan. 15, which said account was declared by Treasurer Danby 1677, June 26 : said sum being an ipsum contained in said account, which he prays the grant and allowance of, in regard he attended that service 5 years and had but 3 years' salary allowed him upon his accompts and did not bring to accompt any incident [al expenses] for many long journeys, wherein he expended his whole salary and further had losses of about 300l. by returns of moneys, he having also brought several profits to account which were not accompted for in former vacancies of that see : the King being pleased to grant his request upon these considerations. Ibid, p. 298. Same from same to the King's Remembrancer to deliver up the bond of abovesaid Ed. Arden for his abovesaid receivership for the 3 years 1671-2, Jan. 15 to 1674-5, Jan. 15, he having (with allowance of the abovesaid ipsum) cleared his account thereof. Ibid. Treasurer Danby's subscription of a docquet [of a privy seal] for giving allowance to John Shales (upon his account now passing for 6,538l. 6s. 8d. set in super upon him by Richard Mounteney, late Receiver General of Prizes) of several sums by him paid to several persons amounting to 601l. 15s. 2d. in all, and also of 300l. for 1½ years salary to himself as chief clerk to the late Commissioners of Prizes in London port in the late Dutch war, and of 20l. for incidents in that service : all which sums the Auditors of the Imprests refuse to allow (because he cannot produce sufficient vouchers for the same) without the authority [of this privy seal]. Docquet Book, p. 34. Royal warrant to the Clerk of the Signet for a privy seal for the making of allowances as follow to the Earl of Bath in his account now passing of the moneys (37,065l. 12s. 9d.) which he received between 1670, Dec. 28, and 1677, June 30, for the building of the royal citadel upon the Hoe of Plymouth. The said Earl being now upon his accompt for the said moneys craves the allowance of several sums of money which are not warranted to be allowed him by the Commission and instructions to the Commissioners appointed to take the care of the building of the said citadel, in regard some of them were expended for things not at all relating to the building thereof but [were] for the King's service in other places and by the King's special direction, and others [were] for payment of salaries to officers appointed to oversee several matters relating to said citadel over and besides such officers as by the said instructions were thought fit to be appointed to manage such building and were by the said Commissioners judged absolutely necessary to be employed about the same, all as follows, viz., 247l. 0s. 4d. paid by the Earl of Bath to Sir Barnard de Gomme, Kt., the King's chief Engineer [of forts &c.] for expenses in going to Ireland "about our special affairs and by our order" and for his attendance there 1674, April 8, to Sept. 26 following, with coach hire and postage ; and 3l. more paid to same for his charge in going to view the works at Sheiends in 1675 ; and 5l. 13s. 6d. to same for his expenses in going to Tilbury to view the works there in 1676 ; and 200l. to same "by our special warrant dated the 28th Sept., 1673," for his extraordinary services before that time performed and afterwards to be done by him. And 158l. 10s. paid by said Earl to several persons for reparations of the King's buildings and fortifications in St. Nicholas Island. And 20l. paid by same to several persons for repairing the platforms, walls, portholes and stairs in Mount Batten. And 441l. 12s. 0d. paid by said Earl to John Rules for 552,000 of clamped bricks by him delivered for the use of the fortifications at Tilbury. And 900l. by said Earl paid to Peter Sheppard as Treasurer and Paymaster of the money issued for the building of the said citadel from 1665-6, Jan. 1, to 1674, Dec. 31, at 100l. per an., nothing being allowed him on the former accompt of said Earl. And 200l. paid to Phillip Piper who succeeded said Sheppard as same, viz., for 2 years to 1676, Dec. 31. And 32l. 8s. 0d. paid to Phillipp Lanyon, chief overseer of the works for said building, viz., for half a year 1673, Sept. 10, to Feb. 19 following at 4s. a day. And 148l. 11s. 0d. paid to John Sugar, clerk of the cheque and overseer of the said works, for his wages of 3s. a day 1670, Aug. 13, to 1674, Dec. 31, and 3l. 7s. 0d. to same for said service. And 125l. 12s. 9d. paid to Henry Hooke, clerk of the cheque of said works, for the like wages, 1674, Dec. 7, to 1676-7, Feb. 20, and for charges of letters, and for expenses of his journey to London, when he was dismissed that employment. And 11l. paid to Tho. Truman, overseer of said works, for his wages of 12d. a day, 1673, Mar. 25, to Nov. 1. And 80l. paid to George Smith, for writing the ledger books for the Auditors and making a transcript thereof for said Earl and for modelizing the bills, orders, acquittances and other vouchers relating to said account, and for attending the examining, stating and declaring thereof. And 70l. for the charges of passing said account. And 90l. paid by order of the said Commissioners for 6 marble chimney pieces and for 3 oval marble tables with a quantity of rough marble for the officers' houses in said citadel. And 2l. 19s. 0d. paid to William Pierce for painting a map for [of] the prospect of Plymouth. And 34l. 5s. 6d. paid to Hendrick Dankart for several prospect pictures and landskips by the King's command and by command of said Commissioners. And 85l. 10s. 0d. paid to Edward Bull for charges in soliciting for the receiving and returning of money from London to Exeter, Plymouth and other places for said service ; and 17l. 6s. 8d. paid to same for disbursements to sundry officers and clerks for copies of warrants, orders, bills of imprest and other writings for the ordering, advancing and impresting of money towards the charges of said building ; and 110l. paid to same for his pains in the said employment of solicitor for 11 years, nothing having been allowed him for same in the said Earl's former account. And 1,000l. by said Earl paid to several persons at several times for advancing 10,000l. for the use of said works, being part of the moneys wherewith he is charged in said accompt, being 10 per cent., it appearing by certificate from Sir Geo. Wharton, Treasurer of the Ordnance, (of whom the said Earl received the greatest part of the moneys for said building) that said 10,000l. was not paid to said Earl in money but by the delivery of 3 tallies of assignment on the Excise ; one dated 1674, July 12, for 2,000l. (assigned 1674, July 20), two dated 1674, July 30, for 3,000l. and 5,000l. respectively (assigned 1674, Aug. 4). And it appears likewise by a certificate of Elias Ashmole, Comptroller of Excise, that [the tallies for] said 10,000l. were not paid to said Earl until very near the expiration of one year after said tallies were assigned, and said Edward Bull certifies that he paid said 10 per cent. rebate for the advance thereon, it being then thought that said tallies could not reasonably come in course to be paid within less than a year. The total of the above sums being 3,986l. 15s. 9d. The King being very well satisfied that all the above sums are fit and reasonable to be allowed hereby orders such allowance to be made in accompt. (Treasurer Danby's subscription dated Mar. 19 of docquet hereof.) King's Warrant Book VI. pp. 202-5. Docquet Book, p. 40. Warrant from Treasurer Danby to Sir Stephen Fox, late Paymaster of the Forces, and Lemuel Kingdon, present same, to pay to Brooke Bridges and Robert Done, Auditors of Imprests, out of moneys for the contingences of the Forces, 30s. per company of foot and troop of Horse that shall appear to be mustered in the accounts of the Guards and Garrisons from 1669, Sept. 23, and 1670, Sept. 24, respectively, until 1673, Sept. 20 : the said Auditors having petitioned for an allowance for their pains in auditing the accounts of the Guards and Garrisons, which petition was referred by Treasurer Danby to Charles Bertie, Sir C. Harbord and John Lawrence and reported thereon by them 1677-8, Jan. 24, that said allowance has been made to former Auditors of Imprests, viz., for the Garrisons up to 1669, Sept. 23, and for the Guards up to 1670, Sept. 24. King's Warrant Book VI. pp. 215-6.